..:: EURO-BOWLING.COM - PROFESSIONAL BOWLING LANES AND CENTRES - Home page ::..
EURO-BOWLING has been manufacturing, installing and selling bowling lanes since 1995. 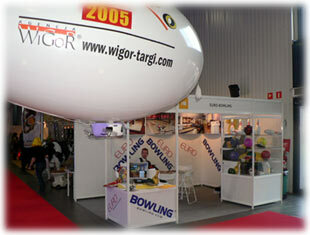 EURO-BOWLING is active throughout Europe; main branches are located in Poland, Slovakia, Croatia, Russia and Hungary. EURO-BOWLING is the Europe’s most advantageous solution of professional bowling products with the lowest installation costs and subsequent operating costs. EURO-BOWLING delivers, installs and services all string- and stringless technologies. EURO-BOWLING installs new bowling lanes and technologies fulfilling the most stringent criteria; these will satisfy hobby and professional players aline (our product range includes professional stringless pinsetters and also hobby-level string pinsetters). Two-lane bowling and three-lane bowling - assembly. EURO-BOWLING also offers installation and service of quality skittle setters, including the electronics – „Nine bowling“. EURO-BOWLING has ABC, WIBC, and ISO 9001 certificates for offered products and accessories. EURO-BOWLING offers only high quality products, durable and reliable.